Manufacturing Day is a growing grassroots movement meant to help draw public attention to the value of manufacturing as a career path. On October 3rd, manufacturers across the country will be introducing parents, students, job seekers and other members of their respective communities to the opportunities of a manufacturing career. It’s called Manufacturing Day, a national event put on by hundreds of manufacturers to showcase modern manufacturing technology and careers. The event is designed to improve the industry’s public image and demonstrate the benefits of participating in this growing sector of the economy. It is hoped that students and job seekers will discover the challenging opportunities offered by a career in manufacturing and be inspired to develop the skills necessary to seek work in the industry. In support of this year’s upcoming Manufacturing Day, AWO takes a look at a few business enterprises that highlight the variety of opportunities that a welding career in manufacturing can offer. 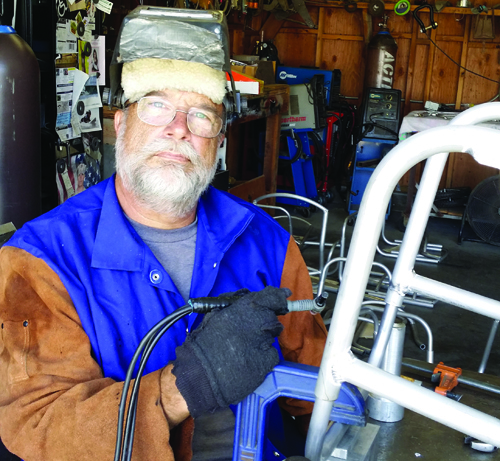 Mike Box prepares to work on a wheelchair frame at his shop in Norco, Calif.
Thirty-three years ago John Gunnar Box was in a motorcycle accident that rendered him paraplegic. John ended up in a wheelchair, but that didn’t stop him from playing tennis. Unfortunately, when John asked the company that manufactured his tennis wheelchair to make adjustments for the sport, they said no. That didn’t stop John from playing tennis either. Instead John and his brother Mike Box decided to build a chair themselves. That decision led the brothers to start their own wheelchair manufacturing company. After more than 20 years in the business Mike Box is still inspired. If you can dream of doing something in a wheelchair, Mike and his crew at Box Wheelchairs will build one to make it happen. Each of the custom built, 6061-T6 aluminum chairs is held together by sturdy welds produced with the Gas Tungsten Arc Welding process. Box prefers this method over the standard nuts and bolts typically used in wheelchair manufacturing because a weld can’t come loose and fall off. And that’s important considering the variety of wheelchairs that Box Wheelchairs builds for clients who play sports like basketball and perform aerial feats in wheelchair motocross. A tractor pulls a harvester through a field. Harvesting machines must be built to handle the potatoes as gently as possible, yet be strong enough to withstand the abrasiveness of soil and rocks. Welding is definitely not the first thing that comes to mind when you pick up a potato, but if that potato you’re holding isn’t covered with bruises then there’s a welder out there who is at least partly responsible. Spudnick Equipment Co. LLC, which got its start in 1958, manufactures a wide variety of planters, harvesters and handling machines that are used with grains, nuts and other vegetables in addition to potatoes. 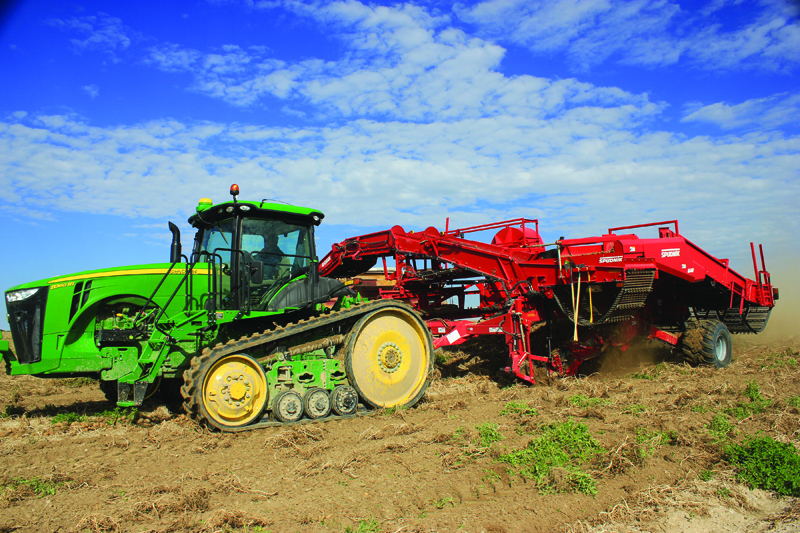 The equipment is specifically designed to ensure that each potato doesn’t fall too far or land on too hard a surface. The machines are also made primarily from carbon steel, which is why 50 of Spudnick’s 250 employees are welders skilled in the Gas Metal Arc Welding, Plasma Arc Cutting and Laserbeam Cutting equipment needed to manufacture these machines. Phil Brown poses in front of his invention, the Apple Harvester, while workers use it to pick apples in an orchard. Like Spudnick’s machines, Phil Brown’s apple harvester makes use of modern technology to make sure your chosen type of produce reaches your table unblemished. 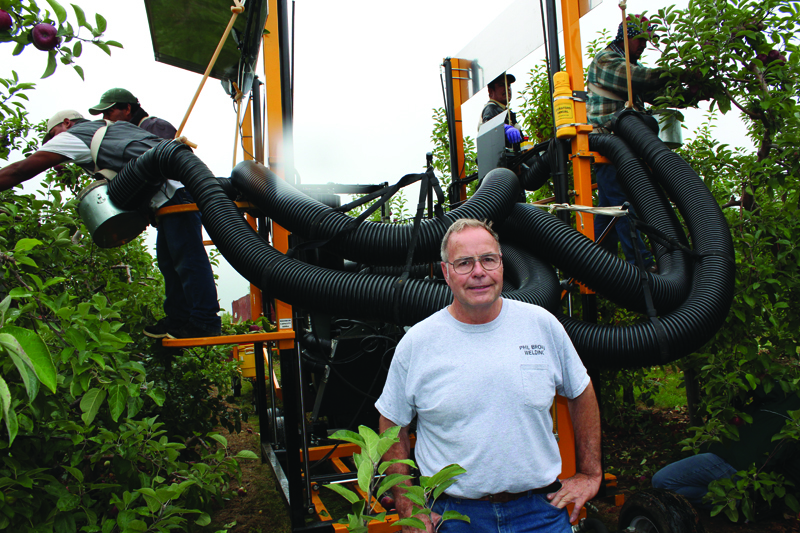 The Apple Harvester is one of several pieces of equipment Brown has invented for fruit farms, greenhouses and nurseries. Workers stand on a self-propelled platform attached to the Apple Harvester from which they pick apples that are dropped into foam-lined pails. The pails empty into a rubber padded hose that leads to an aluminum head where the apples are moved by a cushioned paddle wheel to slow their descent. Brown’s family-run business uses the Gas Metal Arc Welding process to build the lighter sections of the mostly steel-tubed Apple Harvester, although Gas Tungsten Arc Welding is used for the Harvester’s aluminum head. Phil Brown Welding Corp started out 50 years ago building farm equipment with little more than a cutting torch and Shielded Metal Arc Welding with 7018 electrodes. Today, things are a little more high-tech. “We can build equipment faster and better,” said Brown. Whether you’re a student thinking about welding as a career, or an established welder looking for a little inspiration about creative new ways to ply your trade, opportunities in the field of welding are many and varied. On October 3rd, 2014, companies across the country will be opening their doors to show just how welders and other skilled workers can have long and fruitful careers in manufacturing. For more information about Manufacturing Day and resources to advance your career visit American Welding Online. And if you’d like to read more about the unusual industries we’ve discussed in this blog post, check out Welding for Unique Industries by Mary Ruth Johnsen and Kristin Campbell, in the July 2014 issue of the Welding Journal.